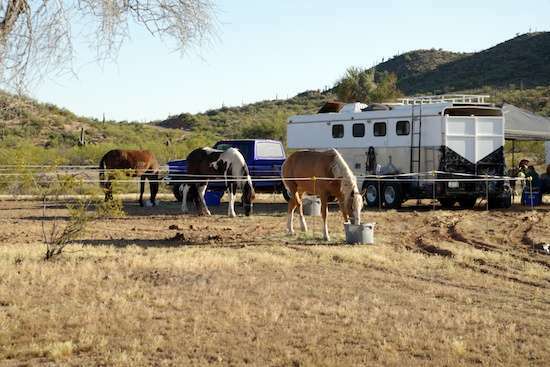 Clip-clop, horse-flop… Suddenly the joint is full of horse trailers! Today is Sunday. 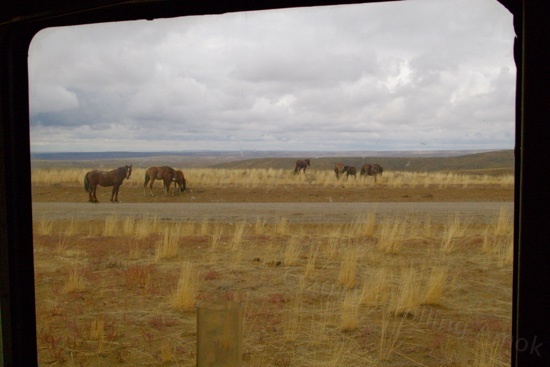 Thursday, a couple of horse trailers rumbled into the State Land Trust parcel I’m on. Friday, many more came. The three campers here were soon surrounded by maybe a dozen horse trailers, and I’m not talking about one-horse or three-horse. We’re talking the bigger ones that range from a two-horse with bunk ahead, to huge travel trailers with slides, and horse stalls in the rear. They’re no doubt here for the Desert Caballeros ride, an annual invitation-only men’s ride out in the boonies that lasts for five days. The departure day is Monday. These people tend to come from all over the West. Yep, I was impressed. I assume that fencing tape is electrified. 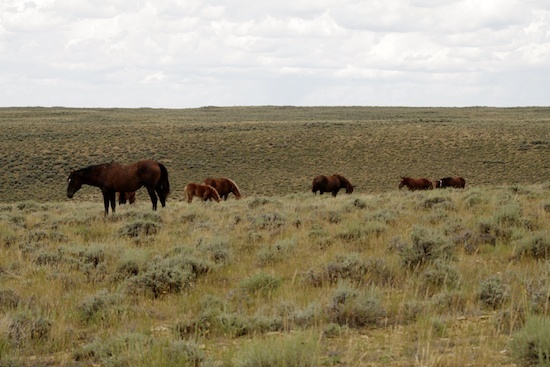 This group of horses was just yards from the roadway. I was in shock for about five full seconds and then careened over to the shoulder to snap this. Remember the recent post about team roping? I wondered about whether this event was now a hobby/sport unrelated to today’s realities about cattle farming. You know, mechanization, efficiency, feedlots. On my way back from a grocery run to Chino Valley, I unexpectedly found the definitive answer to my quandary. 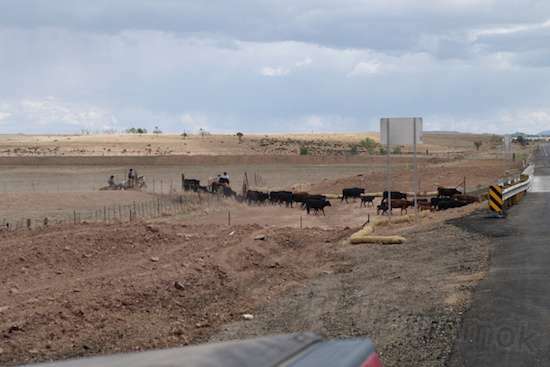 A good-sized herd of cattle was moving toward an underpass running below the roadway on 89. Lo and behold, what was moving them was a group of four mounted riders! Groping blind, I could not locate the camera behind the passenger seat. Damn! 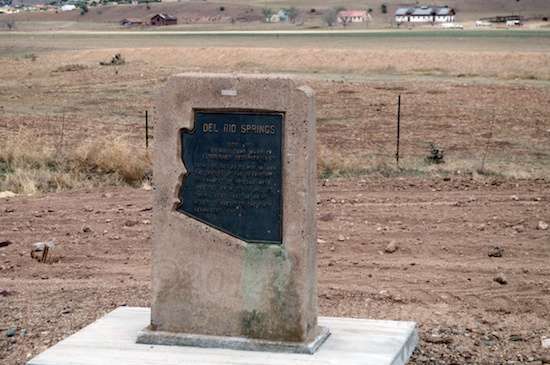 With traffic tailgating me at 65 MPH, I yanked it over onto the road’s paved shoulder near a roadside historical marker, and hit the 4-wheel discs bigtime. I realized an issue as I reached for the camera again. Wrong lens. They’d be little specks at this distance. So I’d have to switch it on and use the menu system to ramp up resolution, and take my shots. Then I’d have to crop the heck out of the shot later, but at least I could. The road’s shoulder was tilted pretty good, and the Ford’s heavy door was a challenge to get open, but desperate men do desperate things. I expected the Pentax’s LCD display to wash out in the strong light, making the resolution adjustment tough. But no, it was readable, and fortunately Pentax had not buried the adjustment deep in the menu system. Done in a few seconds. Aim and fire. I only caught the very end, but hey, it’s proof that here and there, the Old West is still the Real West. I think I know a couple people who’d pay to be allowed to do this! Caution: The post below contains a large heap of photographs. If your data plan is extremely limited and you usually use it all up each month, you may want to NOT click on the “More” icon to keep reading (or view the brief video) because all of the photos will begin to download with the rest of the article. There are some very nice snaps in it, if I do say so myself. The photos illustrate how things work and what often happens. Reduced to blog size, each photo is tiny space-wise, but there are about 100 of them, so they add up if you have no space at all to spare. If you already squander your monthly plan on occasional photo galleries, YouTube or Facebook, make a vow to watch one less video of a monkey picking its nose, and keep reading this instead. 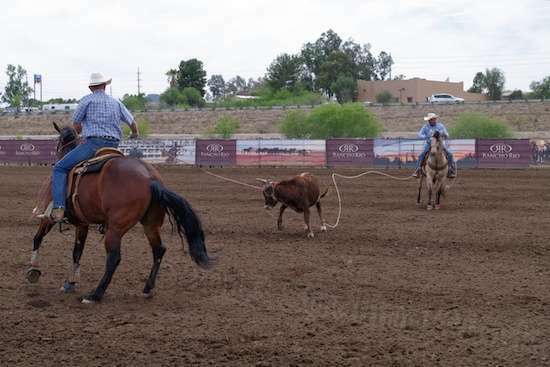 Once a steer is too large for one man to handle, team roping comes into play. 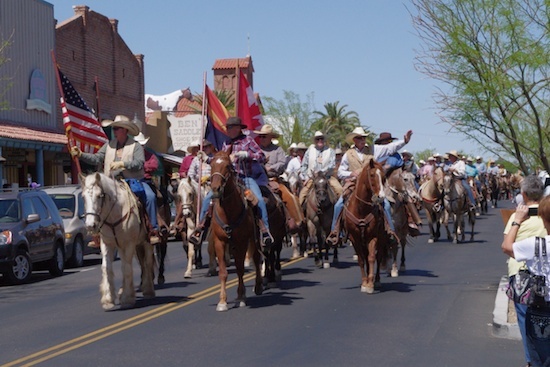 Wickenburg, Arizona still wears its Old West heritage on its sleeve, and for good reason. It’s still a ranching and equestrian town. As a result, each winter from November to April, there are numerous team roping events in any of several arenas in town, public and private. Team roping is a rodeo event that contains one steer, two mounted riders, and a couple of ropes. The historical goal is to quickly capture and immobilize a full-grown steer too large for one man to handle alone. 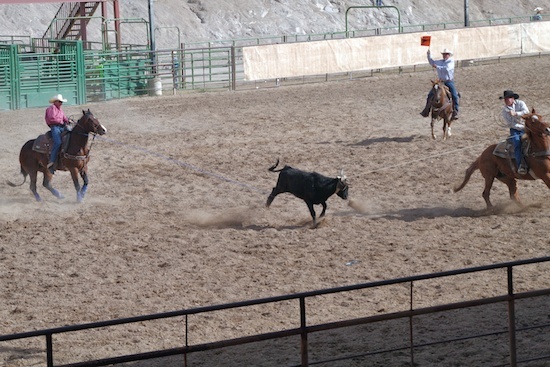 To do this, the first rider tries to rope the steer’s horns, head or neck, while the second rider must rope both of the animal’s rear legs. Once the two pull far enough apart that the steer is judged as immobilized, the elapsed time is called. Team roping is about the only rodeo event where gender means nothing. It’s a straight-up race against time and other teams. 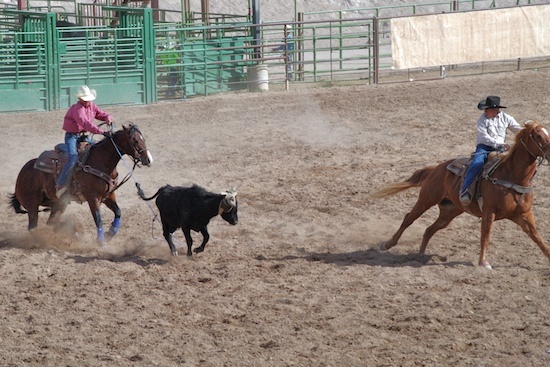 Notice that the rider on the left has thrown his rope while the steer’s rear feet are on the ground, and also the very small size of the loop! No way, right? There’s a five-second penalty for roping only one rear leg, and same for either rider leaving the train station early. The equipment is not particularly specialized except for the two ropes. Once you see the photos below, you’ll know why. Each rope does a different job and must behave just so in order to succeed. You’ll notice that the steers are wearing protective horn wraps, which prevent rope burns and reduce stress on the horns. I’m very glad I took plenty of sequential photos, because that made it possible for me to see just how absurdly difficult team roping is to do well. It also helped me appreciate just how much training and experience the working horses must have in order to pull this thing off. Same riders a couple seconds later, and the impossible has occurred. Both ropes are firmly in place, and completion is about to be called. The departure out of Wickenburg. 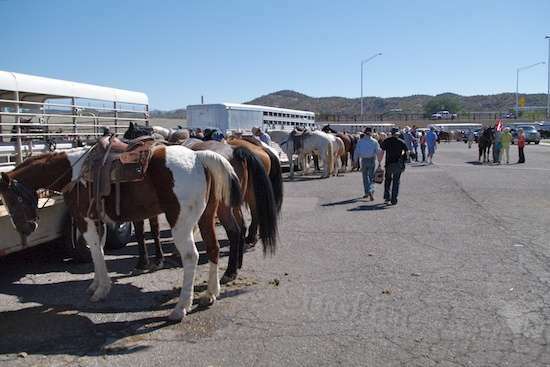 Each year since 1947, an event called the Desert Caballeros Ride takes place. An invitation-only event, it provides a couple hundred riders the opportunity to ride and camp in the surrounding mountains for five days, and then it’s over too soon until next year. This year’s 180 riders will split into groups of forty and move between three camps over about 100 miles before returning. This now-historic ride has inspired several others in the area, including one exclusively for horsewomen (who showed their more civilized natures by chipping in for a portable shower). A few local horses were individually trailered in, and this one of them. What a beauty. So, what I’m presenting here is not a parade through town, per se. It’s simply the orderly departure of some 180 riders heading off for the desert. 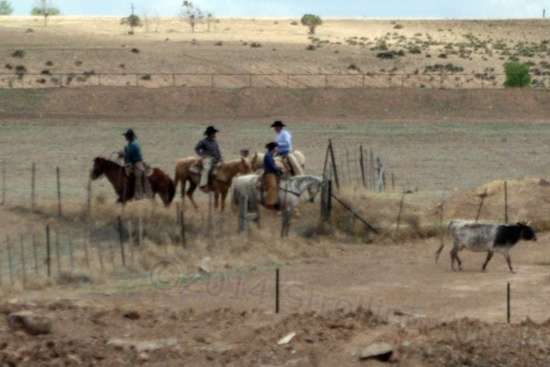 As Wickenburg is at the juncture of two state highways and lacks a suburban-style network of roads, these boys clog up this town quite effectively for fifteen minutes or so as they head right down the main drags. You’d think the town’s police would view it as an annual nuisance, but not so, not from what I saw and heard. 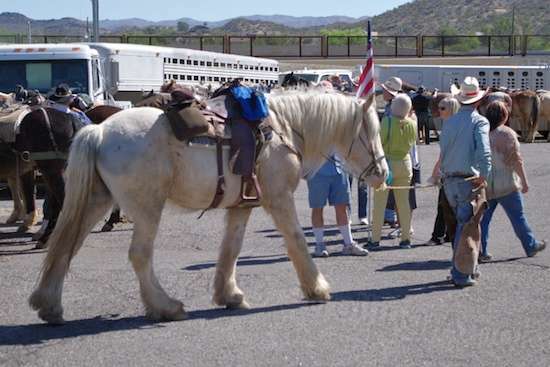 The ride is a part of Wickenburg’s proud heritage, and the town now depends substantially on tourist and vacationer dollars. 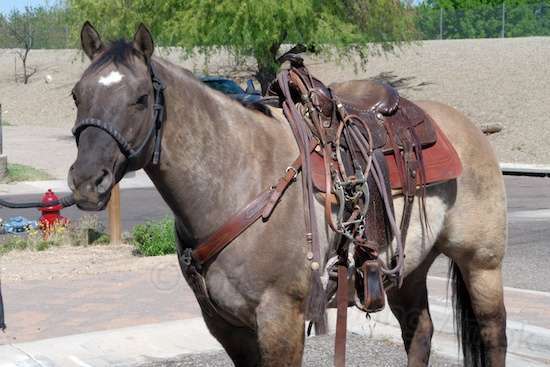 Although there are other equine events, any loss of interest in this ride would directly impact the town’s ability to promote itself. 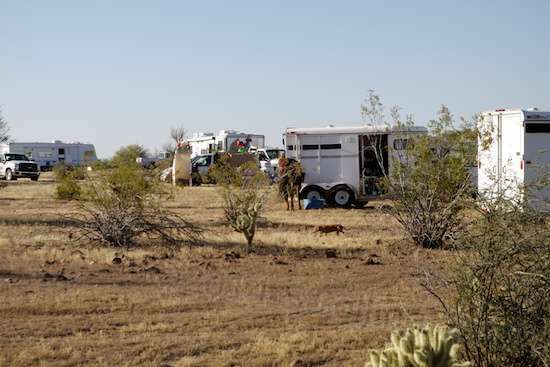 If anything, it’s in Wickenburg’s best interests to protect and promote it, and that attitude is apparent in the officers having to reroute through-traffic with minimal delay to everyone involved. I was impressed. Calm, confident and friendly, without a hint of grumpiness. This shows most of the trailers, but let’s just say there was a heap o’ horsies. More than a few of these riders have been heading out for a couple of decades. Many are local, many are not. The age span runs wide. It’s apparently a good time, and once you’re hooked, there’s no way you’re not going next year. I was able to tour the Community Center’s parking lot among a half-dozen long, long horse trailers, and here is a little of what I saw. This critter may not win the running or barrel races they hold out there, but he’s still impressive.